Speaker of the House Mike Busch presides over the last few minutes of the 2012 legislative session. Lots of people in Maryland, particularly Republicans and minorities, didn’t like Maryland’s congressional redistricting in 2012 that helped eliminate one of the last two GOP seats and did not create another potential minority district. Busch was at a conference on the historic Continental Congress in Annapolis and responding to an question from the audience criticizing the gerrymandering that helped redraw the 6th Congressional District. The plan added thousands of Montgomery County residents so that 10-term Republican incumbent Roscoe Bartlett would lose to a Democrat, as he did to Rep. John Delaney in 2012. Busch was one of the five members of the Governor’s Redistricting Advisory Committee which drew the new lines for both congressional and legislative districts. “I think we could have a done a better job,” Busch said, in keeping communities together and providing fairer representation. But he said the incumbent members of Congress — the six Democrats — had their preferences — and the plan had to get an 85-vote supermajority in the House of Delegates. The governor controls the process, and “no governor is going to give it up,” Busch said. While some Democratic incumbents may have been pleased, Reps. Donna Edwards in the 4th District and Chris Van Hollen in the 8th were unhappy giving up parts of Montgomery County and picking up Republican constituents elsewhere so the 6th could become more Democratic. Edwards won reelection with 77% of the vote overall with the help of Prince George’s County voters, but she got only 39% of the vote in the new Anne Arundel County precincts, losing to Republican political novice Faith Loudon. Van Hollen of Montgomery County won reelection with 63% of the vote, but he lost badly to conservative Ken Timmerman in the heavily Republican parts of Carroll and Frederick counties Van Hollen had picked up in redistricting. The split in the Republican Party between the so called “establishment” and the Tea Party activists who are rabidly anti-tax and anti-government is not far from the surface at GOP gatherings, like Thursday night at Howard County’s long-delayed Lincoln Day Dinner. Rep. 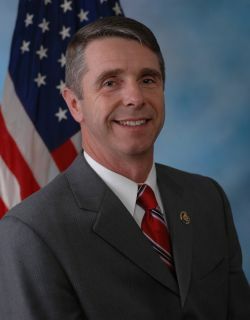 Rob Wittman of Virginia’s 1st Congressional District, a member of the House Republican Study Committee pursuing a conservative social and economic agenda, gave a red-meat speech attacking Obamacare and defense cuts. Questioning the congressman after the speech, Joel Rosenberg, identifying himself with the Tea Party, complained about the Republican “establishment” who “didn’t stand for anything,” particularly House Speaker John Boehner. “These people are terrible,” Rosenberg said. In an interview, State Party Vice Chair Larry Helminiak of Carroll County, admitting he was part of the far right wing of the party, noted the recent victories of conservative parties in Australia and Norway.